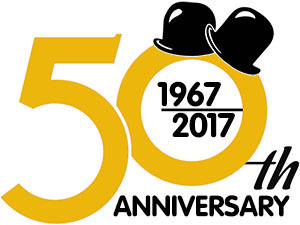 Join us for our special 50th Anniversary Celebration. The doors at The Mayflower Club will open at 4:00 p.m. When you arrive, all attendees will receive a complimentary 50th Anniversary Way Out West Pin and a full size fez. Our Special Event evening will start off, as soon as you check in, with games, games, and more games. There will be a Wheel of Fortune Game, a Bean Bag Toss Game, a Ring Toss Game, a Dart Game, and a Guess How Many Candies in a Jar Game. There will be special prizes awarded for the Dart Game and the Candy Jar Game only. All the other games will win you a prize just for trying. You can do those games as many times as you like. While the games are being played, a limited dealers' table will be open. Also, during the games and during breaks in the evening, all the music that we play will be from 1967. Yes, all the music for the evening will be fifty years old. Our food for the evening will come from the highly recommended, Cafe on Location. Cafe On Location is an authentic crew feed company. What is a crew feed company, you may ask? It's a company that makes up special meals and then delivers the hot food by truck to movie companies that are filming on location. It's a very competitive business and the owners of a crew feed company always hire great cooks that can prepare a lot of different great dishes. The food types for our Special Event will be chicken, fish, and pasta (you may have some of each, if you want) along with salad and veggies. Our club will provide the drinks for the meal. We'll serve cake, later in the evening. The line for our meal with start at 5:00 p.m. and continue until 6:00 p.m. At 6:30 p.m., we will begin our program. We'll do something special that we have rarely done at a Way Out West meeting--we will honor our members! We will call up individual members in three groups. Some members will be in more than one group. Those groups will be: The Tent Stakes (members who have been members the longest), The 50 Plus (members who have been to more than 50 meetings), and The Worker Bees (members who have worked for the Tent behind the scenes). Each member called up on the stage will receive a certificate and a special Way Out West key chain. After group photos, we'll take a break for cake. Jim MacGeorge will once again entertain us with some of his excellent stand-up. Then, our tent members, Bob and Anne Tyszka, will recreate a Laurel & Hardy Jeopardy Game right before our eyes. Study your Laurel & Hardy trivia and mark on your registration form that you want to play their Jeopardy Laurel & Hardy Game. We'll start our video program for the evening with the screening of all of Laurel & Hardy's 106 films (in about two minutes). Immediately after "106," we'll screen interviews with all of the Grand Sheiks that Way Out West has ever had (including Lori McCaffery). We will then see clips of various Laurel & Hardy celebrities that have come to Way Out West meetings and banquets over the years. The evening will end with a screening of our Tent's namesake film, Way Out West. Don't miss out. Please return the registration form before September 9th.